The beginning of Hobart township dates from July 10, 1871, at which time it was organized as Rose Lake (township 137, range 40). On September 5, 1871, congressional township 137, range 39, (now known as Gorman township) was attached to Hobart for all township purposes. Among the early settlers of Hobart township may he mentioned the following: Austin Corbin, F. Meyer, L. Weymouth, John Lick, John L. Johnson, John Bates, James Brompton, William Hecker, Richard Sharp, G. F.Hamilton, Samuel Clary, L. D. Hendry, M. B. Hendry, J. M. Butler, R. L. Frazee, D. D. Cune, E. H. Foster, W. H. Patten, Leonard Ashley, Michael McNulty, John Smith, James Nash and D. Wellman. The latter owned the townsite of Hobart. The first election in this township was held at the home of N. Henry on July 22, 1871. Hobart is the north central township of the county. It lies on the borders of Becker county and is in the center tier of sections. It is bounded on the west by Candor, on the south by Edna, and on the east by Gorman. This was the seventeenth township organized in Otter Tail county. Hobart lies wholly in the basin of the Red river system. The latter stream enters the township from Becker county on the north in the northeastern corner of section 3. 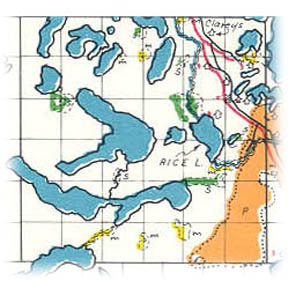 It then flows through section 2 and south through sections 11 and 14 into Rice lake. It then leaves the lake on the southern side in section 23 and courses eastward through section 24 and leaves the township on the line between sections 13 and 24, flowing due east. There are more than twenty lakes in this township, all of which have outlets into Red river. The largest of these are Rose and Long lakes, both of which lie in the central part. Rice. Five, Scalp, Wimer, Graham, Six, Sybil, Gray, Fairy, Jim, Keyes, Gertrude and Mud lakes follow in their order of size. This township bears the distinction which only two other townships in the county can boast of, namely, that of having two railroads within its limits. The Northern Pacific which passes through sections 13, 13, 1 and 2 of this township was built in 1871 and in all probability is responsible for the early settlement of Hobart. The Soo line also came through this section in 1901 and runs through sections 32, 31 and 30. The present township officers are as follow: Supervisors, A. F. Antonsen, Frank Pfeiffer and C. F. Katzke: clerk, George Reff; treasurer, A. M. Mayfield; assessor, H. C. Antonsen; justice, Charles Thomas; constable, A. Pfeiffer. Hobart is located in the northern part of the county in Hobart township, section 2, township 137, range 40. Jt was platted by A. A. Wilcox for David Wellman and recorded June 3, 1873. Wimer Lake Resort is located in this township and county in section 3, on the shores of Wimer Lake. It was recorded September 11, 1907, and platted by O. G. Molden for Solomon F. Anderson. Places of birth for Hobart Township in the 1905 state census.